You may be thinking about giving your garage door a new look; it may still work fine, but it isn’t looking as good as it used to. While this is a good idea, there are some considerations crucial to keep in memory when painting a garage door. These include not just the type of paint you should use, but also the color you should paint it and when you should start the job. Action Garage Door is interested to share some info that will help you do the best job possible. The first thing you want to do is make sure you choose the right primer if you’re painting a garage door made of metal. You will probably be fine if you use a latex exterior primer, because many of them will work well on just about any sort of surface. To be on the safe side, though, talk to a professional and make sure you’re getting exactly the right thing. When you apply the primer, use a sprayer, a roller or a wide brush. Just make sure you protect nearby parts of your property if you choose to use a sprayer. Let it dry anywhere from 12-24 hours – the longer the better. If you have a wood garage door, make sure you use a semi-gloss sheen because it will be easier to maintain. Actually, you may want to consider staining because that will do a better job of showing off the natural wood. 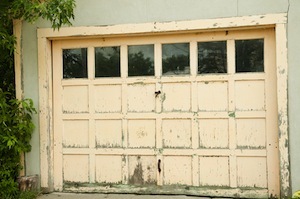 Here are a few other tips that will make painting a garage door a great deal easier. Make sure the weather is good. By that we mean don’t paint if it’s extremely hot, cold or if it’s raining. Try to do it during a part of the day where the door won’t be in direct sunlight for quite a while. Use the same color as your front door and trim to provide unity. If you have any doubt at all regarding your ability to do this type of job, leave it to a professional. Painting a garage door can be a fairly involved project, so make sure you have the time and the patience necessary to get the job done right the first time. If you have any other questions, contact Action Garage Door online or call us at 817-204-0917.